Luckily the cyclist shouted at me so I made a very quick jump to the right, which doesn’t look very elegant if you’re moving at such a speed, but at least a serous impact is avoided. Now I was wondering how fast this cyclist should be moving for running into me. Time to apply some math. The ‘road’ I was running on was a tractor track which consisted of two strips of concrete. I was running on the right one (to be able to take my turn at a decent speed), the cyclist on the left. I was crossing the left one to take my turn. Give a typical tractor wheel base of 2.7m I assume that’s the distance between the centre of the two strips. Obviously, I wasn’t taking my turn at a 90 degrees angle at such speed. 30 degrees looks more like it. To find out which distance and time it takes to cross the path of the cyclists (corresponding to the hypothenuse of a triangle) I divided the opposite side by the sine of 30; this makes 5.4m, as a tempo of 3:30 corresponds to 4.8m/s (1000m/210s), I cover this distance in 1.1s. Now comes the trickier part, how far behind should the cyclist be to be out of sight when quickly looking back before taking the turn. Say I turned my head 75 degrees before taking the turn. The maximum field of view seems to be around 80 degrees, so I am looking behind me with an angle of 25 degrees, anything at a smaller angle would have gone unnoticed. 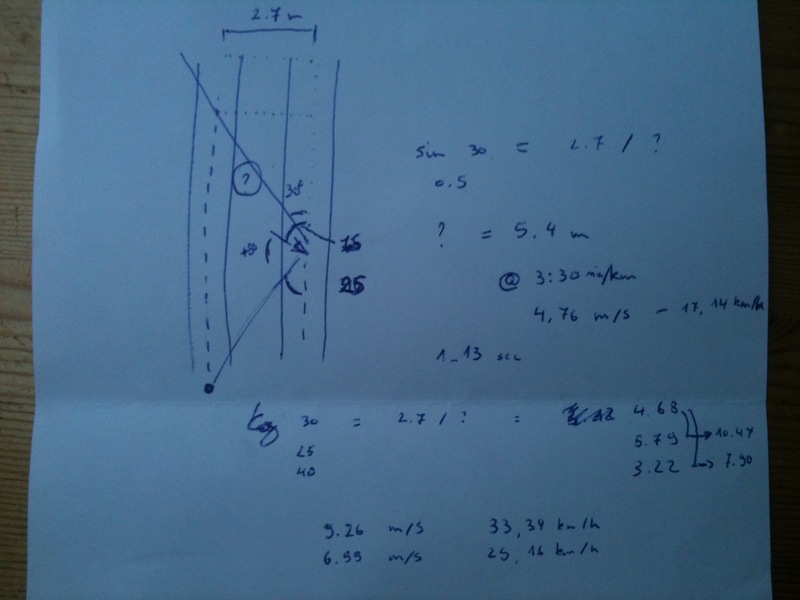 This 25 degrees corresponds to a distance of (only) 5.8m (opposite of 2.7m/tan(25)), together with the forward distance I covered in that 1.1s (4.7; 2.7/tan(30)), this makes 10.5m, which the cyclist should also cover in 1.1s, so at a speed of 9.3m/s or over 33km/h. Clearly, this is a realistic speed for a cyclists and looking behind with a quick glimpse is no guarantee for avoiding collisions. Of, course, there’s a lot of assumptions in this calculation and intuitively looking only 5.8m behind doesn’t sound a lot. But, as I paid closer attention to this, I believe it is quite realistic in real world situations (i.e. at such speed you won’t turn your upper body for instance). Luckily, the chance of a cyclist passing by in this very small time window at such a speed is rather low, but if they do you hope they shout. And running on the other side of the road may help as well. 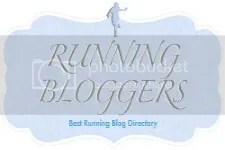 Dit bericht werd geplaatst in Uncategorized en getagged met calculations, collision, running, training. Maak dit favoriet permalink.